Is your computer slow? Are you getting blue screens? Want a wireless installation? Think you have Viruses? Well look no further than The Computer Cafe. 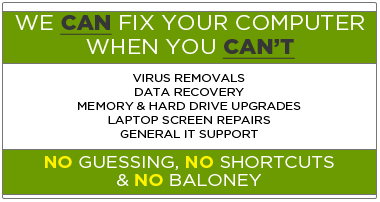 The local computer repair & sales company that has over 15+ years helping the residents and businesses of Somerville, MA with all of its computing needs. The Computer Cafe can help with Slow Computers, Blue Screens, Virus Removals, Laptop Screen Replacements and Repairs, Laptop Keyboard Repair, Data Retrieval, Data Migration as well many other services. Looking for a custom built computer from experts that can stand behind their work? We can do that as well! We also offer on-site, in-home and in-office technicians that are experts in their field and are trustworthy and dependable. NO Guesswork, No Shortcuts & absolutely NO Baloney!! !